Meantime, I will oxidize this one later and share with you the result here. 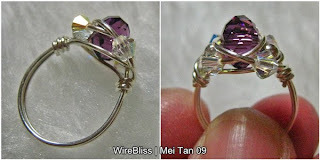 If you would like to learn to make this Sparkly Crystal Ring, check it out at my Etsy Shop - Sparkly Ring Tutorial. Labels: Rings , Wire Jewelry Share it! I like the look of the stone - raw and rough cut.